It's been a whirlwind couple of weeks in the big city for Brandon Nimmo. He moved to Brooklyn. Learned his way around the subway. Had a profile piece about him appear in The New York Times. On Saturday, he got to add an on-field experience to top them all. The Mets' No. 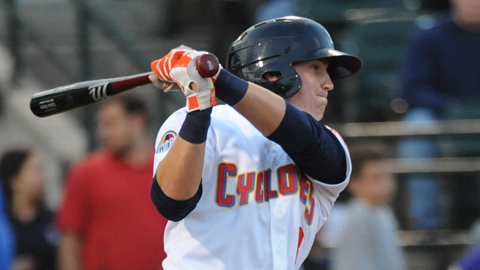 4 prospect hit his first homer of the season, a seventh-inning grand slam that proved the difference in the Brooklyn Cyclones' 6-2 win over the Aberdeen Ironbirds. Nimmo finished 2-for-4, recording his first multi-hit effort in 12 New York-Penn League games. "That just couldn't have been better," said the 19-year-old outfielder. "I was a great feeling. Just thank God for allowing me to capitalize on the opportunity. My teammates had great at-bats that whole inning and really put me in a great position to be able to do that. Meant a lot to help the team." With two outs in the bottom of the seventh, Nimmo took Aberdeen reliever Alex Schmarzo's offering and lined it over the right-field wall to break a 2-2 tie. With one swing, he more than doubled his RBI total to seven. It was a welcome development for the Wyoming native. Before Saturday, he was batting .167 with two extra-base hits through 36 at-bats in his second pro season. He acknowledged there was more of an adjustment necessary than he anticipated. "Then you get a wakeup call and it's definitely surprising. You just play the game and adjust and be confident, know you're going to be all right." The 13th overall pick in last year's Draft raised his average to .200 with a .407 on-base percentage and .325 slugging percentage. His plate discipline has been solid, with 13 walks against 10 strikeouts. Nimmo said he's enjoyed playing in front of crowds like the 7,939 that showed up on Saturday at MCU Park on Coney Island, a new experience for him. He's particularly had fun with the success the Cyclones have had, going 9-4 to open the season. And about that profile in The Times? "It's pretty surreal when you step back and you realize there's an article about you in that paper," he said. "I just like to soak it in, enjoy the moment and then move on because you have to keep going, have to keep working. "Can't read your own headlines, as everyone says." Brooklyn starter Gabriel Ynoa gave up two runs on three hits and a walk while striking out six over six innings. Shortstop Phillip Evans went 2-for-5 with a double and two runs scored.